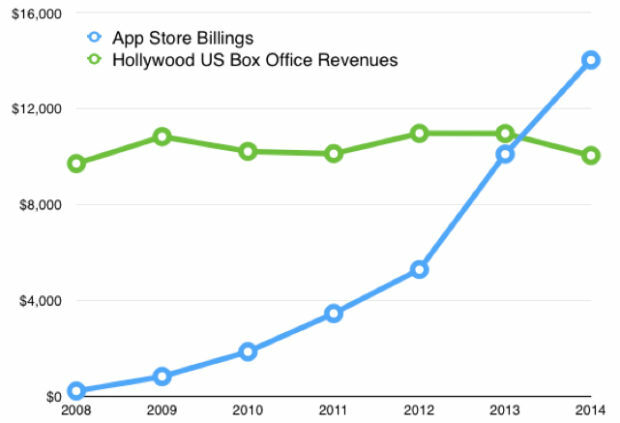 iOS app development generated more revenue than Hollywood movies last year. This mobile application development news blew up Internet earlier this year.The revenue of iOS app developers totaled to $10 billion in 2014. Tack on the sum Apple made itself, and Hollywood top stars and best movies' incomes are beaten by booming mobile app developers' revenue. According to Criteo, mobile application development generates up to 50% of mobile transactions for large ecommerce companies. It doesn't mean, however, that each mobile app developer makes a ton of money monthly: Visionmobile stats say that 50% of iOS app development companies and 64% of Android app development companies get less than $500 per app per month. Nevertheless, from a scale perspective mobile application development is winning the battle for reaching consumers. Why did mobile app development become the closest way to reach consumers? On the one hand, mobile apps reveal true user interests because a decision to download an app is a deliberate one that is made after the app has piqued some user's interest. Taking into consideration these personal signals, mobile app developers target accurately and make profit. On the other hand, with existing rich video and media formats combined with app-based targeting, brands get the power to impact the customer in the right way and increase brand awareness and app engagement. Providing that mobile app developers are aware of user behavior and trends at the mobile application development market, all results in booming mcommerce apps with high conversion rates and user loyalty. iOS app development and Android app development are announced to have their top mobile apps in the spheres of fashion, luxury, travel, accounting, health and beauty as well as sporting goods. It is here where mobile application development is a gonzo machine to reach customers. Below you'll find interesting cases businesses did it. 1. Every brilliant invention is simple. Let's start with mobile application development for fashion industry. A few weeks ago, businessofapps.com published news about a Japanese mobile fashion startup Standing Ovation which announced a second round of investment, to be more precise $1.14 million, into a mobile app XZ Closet that runs both on iOS and Android platforms. The mobile fashion app was launched at the end of 2014 and has been downloaded more than 53,000 times with 270,000 images of different items uploaded. You ask where the secret of mobile application development lies. This newly-made goliath of both iOS app development and Android app development has a completely different approach to the market. Most women own things from various brands and price bracket. Clothes do not always go together. Mobile app developers of XZ Closet assumed it as a basis. Through a mobile app, users can upload an item of clothing they have to a social network. Then, items can be matched to those in other virtual wardrobes and explored for "having a fashion sense on not". Customers create fashion themselves and buy right things. Simple, isn't it? By the way, many famous fashion brands like Zara, H&M, etc. take advantage of both iOS app development and Android app development to reach and retain customers right on-the-go and make shopping experience better to their consumers. 2. To get a reward is always appealing. Shopkick mcommerce app for iOS and Android stands out for the ways they drive customers. In this case mobile application development doesn't rely on some special approaches but increases user loyalty due to special rewards of different kinds. In other words, users accumulate points towards deals in brand shops browsing through the mobile app. Besides, Shopkick reaches users due to effective push messaging, person- and location-aware offers combined with cross-channel access for users. Excellent tactic that is really working for mobile application development and saves money of consumers, isn't it? 3. Standalone service is also on the top. 2 months after launching, HBO now is announced to be the most grossing iPhone app of May, 2015 according to App Annie, a research firm that tracks app sales and downloads. The mobile app developers managed to reach customers providing them with a premium standalone streaming service. Actually, iOS app development makes money in a rather ordinary industry — streaming. HBO now gives instant access to every episode of every season of the best of HBO's award-winning original programming, the biggest and latest Hollywood hit movies, groundbreaking documentaries, sports and exclusive comedy specials. The mobile app is to fill a gap in online content availability for cord cutters in the USA, especially taking into consideration that an Android app is on the way. 4. Mobile app saves time and energy. In our hectic life we often prefer things that are at our fingertips. What are we driving at? Mobile devices. Quick service restaurants like McDonalds, Burger King, etc. keep pace with mobile application development and are lavishly rewarded for it. Customers can place orders ahead of time without waiting in line. American quick service restaurant Taco Bell launched the first order-ahead mobile app in October, 2014. Within the first 4 months after launch Taco Bell's app was downloaded over 2 million times on multiple platforms. The restaurant saw a 20% increase over sales made at the register. Customers can sign up, sign in, or skip it, register a credit or debit card and even a gift card for quicker payment at checkout as well as place orders from a location of their choice. 5. Smart and full of initiatives. As it was mentioned before, analysts announced top five spheres where mobile application development is the closest way to reach customers. We would add food industry into the list. It's not just about convenience and saving time with the order-ahead mobile apps. It's also about health benefits and gastronomy. Mobile application development helps to solve the conundrum how to combine food in the right way. iOS app development and Android app development provide users with unique food discovery experience lead by experts. Look. No offence meant, but do you know how to pair wine and various dishes or how to choose the right wine if you are offered dozens of sorts of wine? What wine would you choose for a barbeque party? For a seafood one? There are dozens of questions when it comes to finding the right product. These everyday questions can drive revenue. At Elinext, we ran into this idea developing a mobile app for restaurant business owner. The developed mobile wine guide — Wine PhD — enables access to a wine catalog, provides recipes and tips for food pairing and must know secrets. So, a good way to reach customers is to cure about them on time. 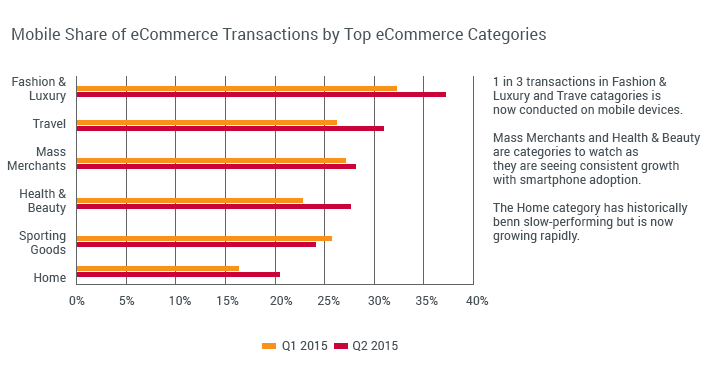 Obviously, mobile application development will not take all e-commerce revenue. E-commerce websites are still very important for customers. But many users do prefer closer, smoother, faster and more personal mobile apps. It means that mobile application development and retail should find their competitive edge to win the battle for customers.